The front and rear parts of the keel are NOT glued together. There is a gap for the prop tube. If you align the ends of part 4 with the slots in the keel parts then this should give you that gap. Make sure that the keel is dead straight along its bottom edge when you join the two ends to parts 4. Here is a picture of a similar model which shows what I mean. I take it that you are aware of Bluebird's excellent build log of the Swordsman? Have a look at Reply #2 here http://www.modelboatmayhem.co.uk/forum/index.php/topic,7668.0.html, which shows how John did that part of the job. It's always worth having a look here first as it could save you time and trouble if you aren't sure about a procedure. 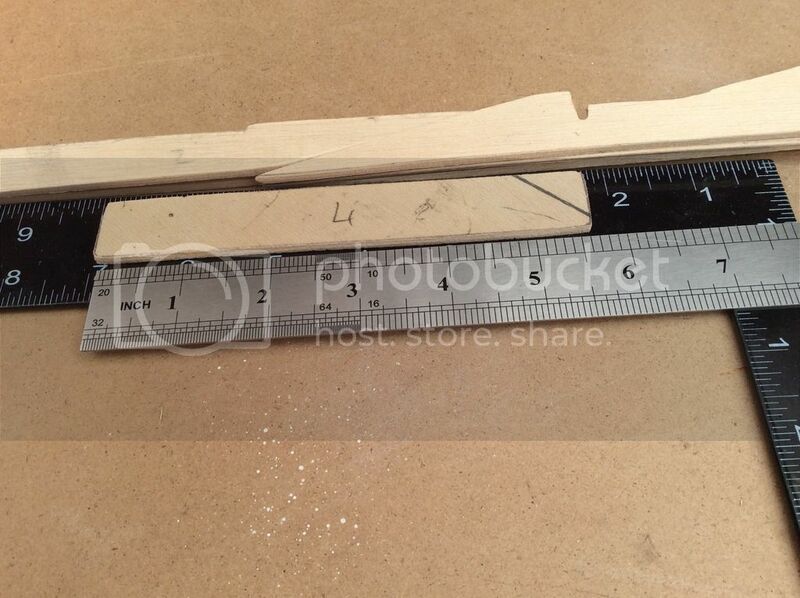 I ask before if I could use Balsa for skinning the Hull of the Swordsman. 2.5mm cover with fiberglass cloth would be enough I think but i was thinking, If I would Use 3mm liteply will it add too much weight for this model? I see no ships !! the original model was built with, I believe, two or three mm thick lite ply skin. To be honest its that long now since I built the model I cant remember now. Technology has moved on leaps and bounds. There is now new Epoxy Resins which are water-based, along with light weight materials would be ideal to skin the hull over the top of lite ply or balsa. I have built similar models recently to the Swordsman and used the water based resins which are quite good (by the way the resin is Deluxe Exe-Kote which I used). I also used the light weight woven roven matting which is the one some of the Aircraft lads and lasses use to skin the wings - its the lightest of the light of materials and it went on really well. More like a lightweight silk. Newbie builder and poster. Am from Arkansas near White River. Have started lots of model boats before but never got over the hump. Have a lot of half built hulls in shop. Found Bluebird's build log and ordered Dave Milbourn's plan to build Fairey Swordsman. Plan makes sense. Bluebird's build log makes it look easy even for me. My carefully crafted keel will lay flat on one side but on the other there is a bow of anywhere from 5mm to 12mm; hold the stern to the table the bow tip is 12mm off of the table. 1. Do I go go ahead and build it up for experience? 2. Is my wood sorry? 3. Is there a wrong way to clamp glue laminates? 4. Would 5 ply birch lay flatter? Hello , it seems a shame that no one has replied to you, so here goes, for what its worth. I'm a bit puzzled how your keel can lay flat on one face, but not on the other ? (I assume you mean that it lies flat if you put a 3mm chock under each end , given that it is joined in the middle by a lapping piece of (if memory serves) 3mm (but then this is assuming that you have joined the fore and after pieces of the keel, which may be invalid assumption)). However, even if it does have a bow/warp, you could do things like pressing it flat and gluing some doubling pieces along its length, and leaving it to dry under weight / pressure. Make sure that the surface it is lying on is definitely flat. By the way i don't mean to patronise you here, so apologies if you have already done this. But probably even if you left the warp in, it would straighten up OK when you glue the bulkheads and stringers in place, as long as you have it pinned down over the plan to make sure that the bulkheads are aligned while it is drying. Probably even then if the keel was a bit squiffy, when the hull skin is put on , you can sand the liteply so as to get the keel line as exposed to the water, straight. I must get on with mine, i have a hull and decks but no superstructure. I love that thread.... really got me thinking again about that Iconic boat to build.. now.... to get some plans???? Some other builds that never got finished I guess! Concentrating in the main, on the fine Fairey Marine boats, which is plenty for me to get on with! now in los montesinos Spain. If you go back to the masterclass section, you will find the complete build. You've posted in the q&a section, the clue is in the section titles. Do you need some help with the build? Why on earth do I do this? That's "540" and not "750". For a brushed motor I would suggest an MFA 540/1 motor with a 7.2v NiMH pack (or 2S LiPo). If your speed controller has battery eliminator circuitry (BEC) then you won't need a seperate receiver battery. I used a PropShop (now Protean Design) 3-blade 1.3" dia x 1.5" pitch General Scale pattern cast metal prop and an SHG M4 tube and shaft. Google for more details on those items. There will be a new kit out very soon for a 1/16 scale Swordsman, manufactured by SLEC. It's similar in size to the old plan but much closer in appearance to the real thing and has a fully removeable cabin for better access to the motor, battery and radio. I hope to have my own model at the Wicksteed Park meeting next month. Hi there, when I first wrote this article I was sure I had put all information required in the write-up about all the hardware I used such as sizes & etc. I do know its an 8 inch propshaft with a M4 thread one end and plain the other end. The model I build I have tried various sized motors and speed controllers and I found that a 500 motor was quite adequate to give this model quite a bit of speed, driving a 2 blade 35 mm plastic prop - the other thing is I had a 7.2 4300 mAh battery in the model and also using a Mtroniks speed controller. I have just recently purchased some other items from a guy on Ebay who I have dealt with many times (I don't have any personal connection with him, but, he has always given exceptional service and any problems / faults would be rectified straight away). Here's a link for the prop tube from the same guy - he may be a bit more expensive, but well worth it. Dear all, thanks for the advice. I don't have any of the hardware yet, so the prop shaft and the rudder will be the first purchases. Apparently I can't use the 35mhz radio from my glider days, so will have to get a radio as well. Sorry to get your name wrong Dave, not intentional, just a typing mistake. That's OK - I've seen a lot more exotic versions of it than that! My advice would be to go brushless if you're starting from scratch. Hi there, just noticed it has been suggested that if you are a novice to go brushless - well - basically it may be easier to learn with 'brushed' motors to wire up along with other things to keep it simple. You wont have to worry about setting your transmitter up and programming the brushless motor for lipo cells and soforth - to keep it simple - buy a NiCad pack, a basic speed controller such as Mtroniks which are plug and play- the majority of them you don't have to worry about adding a further power pack for your receiver as the majority of Mtroniks have what is called a BEC batter eliminating circuit - which does away with the 2nd battery as I have already stated. This keeps things extremely simple. Obviously, gaining a lot more experience in this hobby, then decide whether brushless motors are the way to go for yourself. Obviously, you do as you wish to do - as long as you are able to overcome some of the problems. Purely as a matter of interest, do you have any brushless motors? I have a good collection of brushless motors and speed controllers and also a good understanding of their advantages and pitfalls. With this in mind I am planning a few projects for future builds using them; but its like everything else in this world; best to begin with the basics and guide a person from there. I'm not sure I agree with you there. The only thing you can learn about 'the basics' by using brushed motors is about the basics of using brushed motors. When I designed Swordsman twenty years ago brushless motors were just not available - certainly not like they are these days. I held out against them until about five years ago when Paul Freshney convinced me to try one. There's no way I would recommend a brushed motor for this model these days; they bear no comparison with those little computer-made Turnigy jewels. Brushless ESCs are all equipped with BEC and require no additional wiring (OK - so there are three motor wires to plug into the ESC instead of two). If you're wary of using LiPo batteries then they will work quite happily from NiMH packs. All of the marine ones I've bought came with a factory-set default which was entirely suited to the models I operate, and the increase in efficiency and low size/weight make using one a no-brainer for a small scale powerboat like this. Given the choice of equipment that you already have, which would you fit into a 1/16 scale Swordsman? I'm a relative newcomer (about 2 years) to model boats, well any models, and count myself lucky that I've started when advances have taken place with regards to Tx, motors and batteries. With that in mind I embraced brushless and never really considered brushed at all. Yes, programming an ESC, if required, can be a little daunting, but other than that there is plenty of information available to guide a newcomer through what is required and how to connect it all up. It takes a little effort but that is all part of the interest for me. Dear all. Thanks for the advice so far. Some more questions: Brushless motors vs the other sort (brushed ?). It seems that the brushless are say £33, and the others £7 or so. So, would a brushless motor be approx 4 times "better" / more powerful / somehow superior ? (But perhaps one doesnt buy like-for-like (i.e. a 540 brushless is perhpas not a replacement for a 540 non-brushless)). I'd like the boat (24 inch Swordsman) to go as fast as reasonably possible, but don't want to spend a fortune. Prop shafts - does one have to pump grease into them ? Or do they come pre-greased ? Motor-to-shaft connection - i had assumed that the shaft would be threaded on both ends, but apparenlty some are plain on one end (the inboard I think). Does this mean that the coupling piece uses some kind of clamp mechanism to attach the coupling to the shaft (and presumably to the motor shaft ) ? It's a bit hard to tell from the photos i have looked at, but it looks like they might use grub screws - is that correct ? A bit like the jaws of a lathe i suppose. Brushless motors are considerably more efficient than brushed motors i.e. less current and more power. There's more discussion on your other points elsewhere.